Green leafy vegetables become very messy whenever you try to get the juice out of them. They won’t easily let you extract every pinch from them and that’s why the best juicer for greens is necessary. These type of juicers comes with special spinning mechanisms that not only allow you to extract juice from vegetables, you can also extract every drop from them without any worries. They have got powerful motors running on electricity that allows you to easily extract the hell out of green leaves and vegetables. Now, a problem that most of the people face is, they cannot find an ideal juicer for extracting juice from the vegetables. Reasons may be market saturation, availability of so many brands and a shortage of time. 2 How We Choose the Best Juicer for Greens? How We Choose the Best Juicer for Greens? Now, that all things are clear. Let’s start reviewing these juicers one by one so that you can make a top-notch choice about the product you are going to buy. The juicer that tops our list for being the best throughout 2018 and 2017 is none other than brand new Omega J8006. 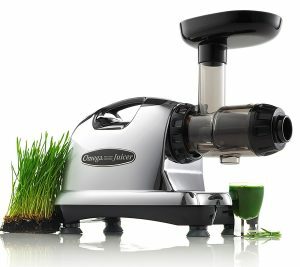 The best Omega juicer for greens has got a lot of quality features and that’s why it has been tried by a lot of people. To be honest, they are all satisfied with its performance so far. 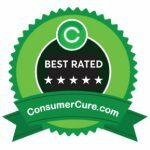 Having an industry-leading warranty of 15 years on parts and performance of the juicer, you get to enjoy it for a long period of time without any problems. This juicer runs on a speed of only 80 RPM and that’s why it is able to produce minimal heat possible in order to promote the healthy enzymes. With the help of this juicer, you will be able to extract a maximum amount of nutrients vitamins, natural taste and every drop of juice for green vegetables. The best juicer for green is really a nutrition center for most of the fitness enthusiasts as it is able to convert nut into butter, can extrude pasta, grind coffee at a fast rate and mince herbs and garlic like a crushing machine. Making of baby food and other types of desserts is also possible with this juicer. The juice yield from this juicer is very high as well. It has also got an automatic pulp ejection function for continuous juicing purposes. Four stabilizing feet are there to make sure that it has got an ideal grip on the ground. The operation is quiet and without any noise so that you can enjoy a peaceful environment while doing your favorite work. 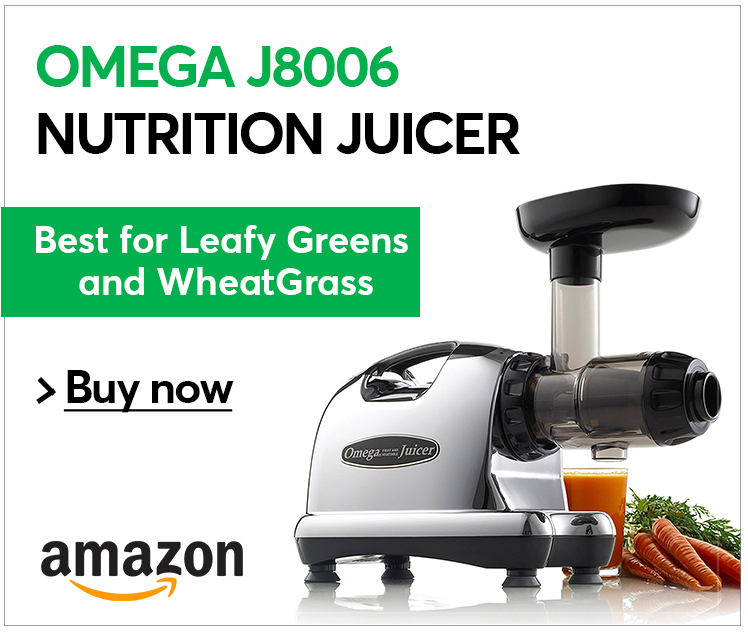 Omega J8006 is a pioneer in the category of juicer used for extracting greens. The best juicer allows you to extract a maximum amount of nutrients easily from any type of raw food. Better buy it in case you want to make a major investment in choosing the best juicer for greens. The next juicer on our list is introduced by Kuvings and has got a model number of B6000S. This juicer is also making its mark in the juicer market and is really a beast when it comes to extracting the maximum nutrients out from greens. The best juicer for greens has got a wide feeding chute so that you can easily extract the juice from vegetables. The assembly and cleaning process is easy which makes sure that you clean it frequently without any worries. The juicer is specially made slow so that it can build up minimum heat production. Use of world's strongest brushless motor is also made available in this juicer. This juicing machine is specially made from Ultem Tritan ABS materials and PC premium design shape that not only enhances the beauty of your kitchen but also increases the durability of it. The smart cap system is also present that allows you to clean the juicer with ultimate ease and convenience. On the other hand, with a powerful 240W motor, you can extract every bit of nutrient from all type of raw foods in order to be healthy and fresh for a long period of time. The operation is quite even if you are using vegetables that are very hard to extract. The motor works at 60 RPM and has got 3-way ventilation as well for an enhanced working process. Special Unique patented technology is also there which makes sure that you extract every drop of nutrient from the vegetables and other food materials. Kuvings BPA-Free B6000S is an ideal juicer for all juice lovers who want to drink the juice out of green leaves and vegetables daily. The juicer comes with some minor defects but that won't happen if you use it with proper care. Go for it in case you want the best juicer for greens with an ideal design. Not for carrots and celery. Bowl cracking issues are common. 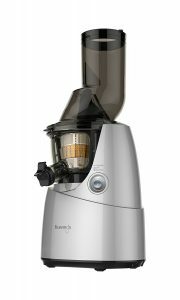 Breville juicer is specially made for low-budget people as it has got a very reasonable price range. The best juicer for greens is easily able to extract a lot of nutrients from raw food materials. It has got a lot of qualities to offer in yet an affordable price range. The juicer comes with a heavy-duty and compact fountain in which the knife blade is centered for a maximum function. The 700-watt motor is there that operates at 14000 RPM which means you will be able to extract every bit out of the green vegetables that are so hard to crush. Safety locking arm is also there to ensure safety and protection of the customer. The best juicer for greens as got an extra-large 3 inch centered feed tube as well. The body is made compact and has got premium quality construction at the same time. With the help of polymer grade body and stainless steel blades combined together with Italian made micro mesh filter, you can easily extract up to 30 percent more juice from the vegetables with 40 percent more vitamins. This juicer also comes with dishwasher-safe parts which ensure proper cleaning of the juicer after every single use as well. The minimum voltage requirement for this juicer is almost 110V to 120V and the power output is 700 watts respectively. With 1 year limited warranty on parts and motor, you get to enjoy a fine juice extracting machine without any future doubts. The pulp of vegetables in this juicer is collected at the footprints in order to conserve the counter for more spacious accommodation. 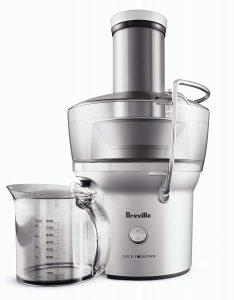 Breville BJE200XL is one of the best choices for people who are looking for a reasonable juicer. The best juicer for greens is able to extract every type of vitamins and nutrients from vegetables and other raw foods. Better buy it before it goes out of stock. In case you are looking for another reasonable juicer, we have got another one for you. This beast also known as Gourmia GJ750 is available in only under 50 bucks and has got a lot of qualities to offer at the same time. The best juicer for greens is specially made to crush the hell out of vegetables that are very hard to squeeze. It has got a wide mouth and you won't have to spend time in cutting and slicing plus prepping the vegetable for a perfect outcome. The motor it has got runs on 850 watts and has got a quiet operation at the same time. There is a simple dial with extraction settings which means you will easily get to know about the machine in only a few minutes. The knob can be turned low for soft fruits and vegetables and can be turned high for harder fruits for an ideal working function. The best juicer for greens comes with a higher capacity option as well. It is able to store almost 32 ounces of juice at once and can also store 8.5 cups of pulp with one single operation. The juicer comes with dishwasher safe properties in order to make it clean in the best possible way. All the parts can be disassembled quickly in order to wash them and keep them away from germs and bacteria etc. This juicer is certified from ETL which means you will always get a safe and high-quality product no matter what happens. With quiet operation, you can easily extract juice from vegetables and different fruits without creating any disturbance in the environment. 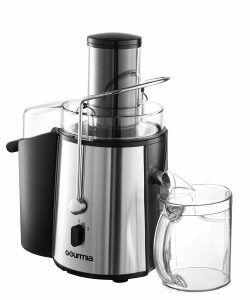 Gourmia GJ750 is the best juicer in terms of low-budget price and simple operation. It allows you to extract juice from soft and hard vegetables with the same working function. Go for it in case you have got a very little amount to spend on the best juicer for greens. Parts quality is also compromised. The next gem on our list is also introduced by Omega and it is similar to J8006 in design and some of the features as well. The brand new NC800 has got an expensive price range and that's because it has got a lot to offer. The best juicer for greens comes with a whopping 15 years warranty on parts and performance so that you can enjoy the reliability of the juicer for a longer period of time. With the motor speed of the only 80RPM, you can extract the juice from the hardest vegetables with very low-noise production as well. The heat buildup f this juicer is also minimum in order to facilitate the promotion of healthy enzymes and oxidation process. With the help of juicer offered by Omega, there isn't a single chance of losing any type of vitamins and nutrients from the extract as it is able to extract them in the best possible way. 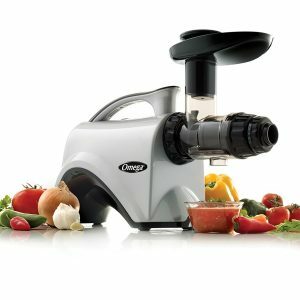 You can also extrude pasta, grind hard vegetables and crush herbs and garlic with this juicer as it has got an ability to do it with ease and convenience. The adjustable end-cap comes with 5 different settings in order to have a maximum juice output at the same time. The motor in this juicer is similar to a 2 horsepower one but has got a very quiet operation without causing any disturbance of the outside environment. Omega NC800 has got an expensive price range but once you have got this machine, it will solve all your problems related to extracting the nutrients from hard vegetables. The best juicer for greens has got an ideal design as well. Buy it if you have got enough budget to spend on an expensive juicer.